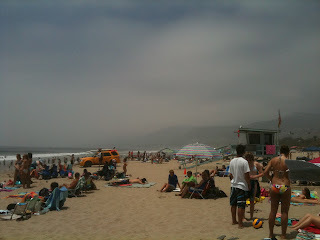 We went to Zuma beach on July 10th. The ocean and I have a special relationship. Apparently, my son is picking up where I left off years earlier. I tried to capture the emotions I felt and the conversation (both verbal and otherwise) I had with my son. He transforms when he's in the water. He is full of life, bursting at the seams with joy. His handsome little tanned face can't contain the size of the smile that wants to explode. My son is seven. Will turn eight soon... he will be a man before I know it. It's a beautiful Southern California day. The sun burned through the overcast day around 11 AM. The waves stretch for the heavens, reaching five to seven feet in their attempt to touch the sky. The smell of the suntan lotion, water and sand have an intoxicating effect. Always have. 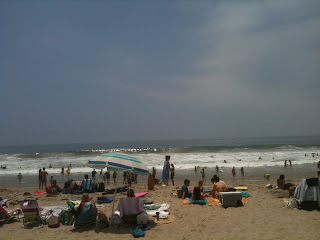 The dissonent sounds of the waves generate a rhythm that very few can discern. Only those who love the beach can appreciate this melody. I love the ocean. I'm scared of the ocean. He marches off on his own, ready to duel with the waves that break in front of him. He collects his courage and takes a few steps in. The frigit water turns my feet blue. He doesn't even acknowledge the conditions. He's my son--I used to be like him. But I grew up. I forgot the magic of escape until I started to write again. I'm grounded in reality--mortgage, career, staff, family, reading and writing. He levitates above all obstacles and duties. He is free. He is seven, nearly eight. And I'm losing him. One wave at a time. I stand behind him, watching his every move. There is a riptide that pulls. There is an undercurrent that charms. There is an ocean that invites. I'm ready to jump in and grab his hand. I am a tense coil, wrapped so tight that I will explode with the slightest of touch. "Be careful, buddy. Keep your balance." "I know, Dad. Don't worry." But I worry. Every day, every second, I worry about my boys. And he in particular. My five year old is happy to play in the safe sand, under the umbrella. He will read one book after another. But my seven year old, jumps into the future without care or concern. He challenges the borders--redefines the borders. A large wave throws him off balance. He tries to steady his body. He's athletic. He's strong. But he's still a little boy. As he falls, he turns his face towards me. The wave rattles him. He's looks at me, into my eyes, into my heart. I run and grab his hand. He smiles as he stands. I don't want to let go. But he's ready to move on. "Did you see that? That was cool," he says. "It was. But be careful." He thinks about if for a second. Then holds my hand again. "let's go deeper, but I'll stand behind you." "Are you asking me to be your shield?" "Yeah. Come on, Dad. A good one's coming." I march forward, he holds my hand, but slides behind me. The wave crashes into me. I'm freezing, coughing out the salty water, trying to blink away the burning sensation in my eyes... but I'm smiling ear-to-ear. Because he's laughing and giggling. I'll be your shield, buddy. For as long as you let me, I'll be your shield. Aww, so sweet. It's hard to let them grow up. Zuma's an awesome beach, but I've never been there when it's that busy, always off season. You may leave the beach, but she can never leave you.